Thanks to the newsletter from our Oregon State Senator Doug Whitsett who is serving on the “Joint Interim Committee on Department of Energy Oversight,” we have a high level look into the spending of taxpayer money on green energy programs. What an amazing exciting time to be republican. Never in my lifetime have I seen such huge crowds gathering to a republican candidate. Having republican voters so excited about their candidate has been invigorating. The crowd sizes even in the numbers that the liberal news media was willing to report were impressive. Night after night Donald Trump was meeting with thousands of Americans. It felt like a wave of excitement was sweeping through America. Dinesh D'Souza's Long Awaited Clinton Documentary in Portland ? This July 22nd the long awaited Dinesh D'Souza video "Hillary's America: The Secret History Of The Democratic Party" is set to be released to a limited number of theaters. If you want to see this documentary on opening day weekend, we will need to be contacting our local theaters and asking if they will be showing it. If the large chains such as Regal Cinemas and Cinemark are paying attention to the past economic success of past Dinesh D'Souza's documentaries, they would be showing this film. WILSONVILLE, OR -- Today, Oregon Republican Party (ORP) Chairman Bill Currier announced the national delegate allocations for the three presidential candidates received following the May 17, 2016 Primary Election. Helping Congestion or Causing Congestion? Koin News 6 disclosed nearly half of the 64 million expected "Street Tax" dollars would be spent on safety improvements associated with the Vision Zero plan. Were you thinking the full 64 million would be spent on road repairs, paving and maintenance or that the improvements would improve traffic congestion? Think again. Lowering the speed limit and lowering the legal limit for drunk driving from 0.8 to 0.5 are a couple of the Vision Zero ideas put forth by Portland Bureau of Transportation Safety Manager Gabe Graff. The city has already requested permission to lower the speed limit on Burnside. The 10 cents per gallon tax is expected to raise 64 million in 4 years. Willamette Week reports that Portland’s young voters gave presidential candidate Bernie Sanders his biggest applause for the following 13 lines. Those voters might want to consider some additional facts. Young voters might want to notice that the Democratic zeal for bank regulation in the wake of the 2008 crisis somehow has managed to destroy smaller banks, benefitting the biggest ones. An unholy alliance of federal power and large banking power will not end well. Giving the government further controls over freedom in political speech will do the same thing as giving government power over anything: we will get less of it. Government is an inherently anti-progressive force, for it is inevitably dominated by established powers that misuse government to protect themselves. In the Republican ideal, government is a referee, not pulling for one side or the other. All that repealing Citizens United does is protect established politicians and tilt the playing field in favor of unions; few remember that the case was about whether publishing a documentary critical of Hillary Clinton should be punished by the government. Do you really think it should be illegal to show movies critical of Hillary Clinton? 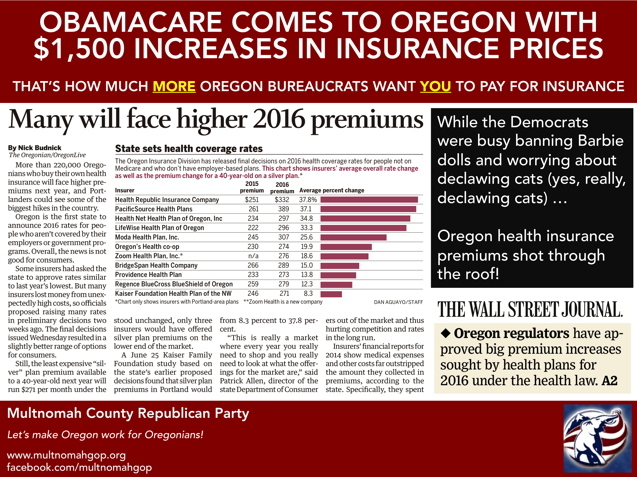 More than 220,000 Oregonians who buy their own health insurance will face higher premiums next year, according to the Oregonian. Portlanders could see some of the biggest hikes in the country. Officials say the rate increases reflect changes to the market due to Obamacare, which kicked in in 2014. More people, including sick people, bought policies in part because insurers were prohibited from denying coverage for preexisting medical conditions. A new tax penalty also punishess those who go uninsured. Last Wednesday, April 8th, Rep Mike Nearman on the Joint Ways & Means SubCommittee on Transportation & Economic Development attended the hearing on SB5513 an appropriation bill for Dept of Housing & Community Services with invited testimony only. Sounds routine. But, this was related to the Oregon Prosperity Initiative that Gov Kitzhaber directed to include Cylvia Hayes and for which a spokesperson was hired by Oregon Business Council to help the First Lady and is the focus of a state and federal investigation.